Every couple of years, we shower kudos upon amateur athletes competing in the Olympics. When The Games are over, however, we return to our more entrenched love of paid professionalism. A bias against amateurs is alive on the Internet, as well, where professional webmasters vie with unpaid amateurs for recognition. But sometimes the simple love of a thing can be more powerful than a corporate portfolio. When you've got the Web on your side, sometimes a simple, pure feeling can be magnified ten-fold and have the force of a prime-time commercial. Without the Web, Mixon's admiration for the lyrics and rhythms of songstress Joni Mitchell would have remained a personal anecdote. 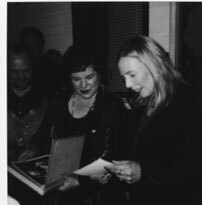 But with the Web, Mixon's passion for the Canadian-born folk-jazz-rocker gave her entry to places she never imagined going and eventually paved the way for her to meet "the goddess" herself, Joni Mitchell. When Mixon and husband Steve bought a PC and Internet connection back in December 1995, Leslie christened the event with a search on her favorite songbird. Ever since 1969 when her sister willed her old Lps, Mixon had been a fan of the writer of such songs as "Big Yellow Taxi," "Clouds" and "Woodstock." Mixon's search dropped her into Wally Breese's fan page at jonimitchell.com, pretty much the only place you could find any information about the singer/songwriter, her performance schedule, etc. "Wally's website was in its infancy at that time," Mixon said last week. Mixon wasted no time in sending the page designer an e-mail asking if he'd like to post some of the photographs she'd taken of the singer at the Bread and Roses concerts in 1978 and 1980. No, Mixon said, she wasn't looking to get paid. "I just wanted the honor," she explained. This May, as a way of saying 'thank you' for the photographs, Breese gave Mixon passes to the photography pit at the May concert at the San Jose Arena featuring Mitchell, Bob Dylan and Van Morrison. Most web-based fan pages are overlooked or merely suffered by the celebrities they honor. Not so Breese's site, which, last year, had an unexpected and life-changing effect on the star herself. In a 1996 New York Times article, Mitchell confirmed the rumor that in 1965 she had given up her baby daughter for adoption. A young Toronto computer student named Kilauren Gibb had long been searching for her birth mother. Her friends, seeing the connection between Mitchell's bio and what Gibb knew about her mother (born in Saskatoon, contracted polio as a child, popular Canadian folk singer) suggested Gibb do a search on the Internet and see what she could find. She found Breese's site and, miraculously, 15 other ways that Mitchell's past matched the information Gibb had about her mother. In March of 1997, mother and daughter were reunited and Breese was credited with making it happen. To honor Breese, Mitchell invited him (and he invited Mixon, husband Steve and a couple of other Santa Cruzans) down to L.A. after the May concert to be part of a select audience for the taping of an upcoming PBS special. "Her manager wanted hard-core fans in the audience for the TV special scheduled for September featuring her new album, "Taming The Tiger," Mixon said. k.d. lang was there. So was Peggy Lipton, Michelle Pfeiffer and Mitchell's old boyfriend, Graham Nash, among others. At the Friday night recording session, Mixon not only met Mitchell but received a warm kiss and a special 10-minute chat. "I told her that next to my wedding day, this was the greatest day of my life," Mixon a singer herself, concluded the story. JoniMitchell.com has generated other intriguing fan effects too. Many of the folks involved in the site got together and produced two cassettes of Mitchell songs. Local musicians on the project included Leslie Mixon, singer with Yazoo Blues Revue; husband Steve, mandolin and guitarist with the klezmer group, Hoo Tza Tza; Neal Hellman, dulcimer player and proprietor of the Gourd Music label; Bob Burnett, percussionist with Pipa Pinon and Pele Juju; and Sharon Allen who has sung with the blues band, Back Alley Band. And Mixon has also gotten involved with Breese in the site Reprise Records hired him to manage, "Hits and Misses," accessible via Breese's page, has some of Mixon's photographs displayed as well as some of her fan reviews. Mixon, Breese et al. are not alone in their reverence for Mitchell. A member of the Rock 'n Roll Hall of Fame, the recipient of numerous awards (e.g., the Grammy), Mitchell is such a talented songwriter that singers as different as Frank Sinatra and Bob Dylan have recorded her songs. "She doesn't fit into any niche, she's beyond categorization," die-hard fan Mixon said, adding that the only reason she hasn't enjoyed the same celebrity as others is a lack of marketing. Mixon, marketing manager for Rainbow Light Nutritional Systems, identified the one thing Mitchell lacks: good publicity. "Marketing is the big fall in her career," Mixon said, pointing out that the Internet could be a way to rectify that fault. "Breese's page does a better job of reaching out and touching someone than the Yellow Pages," she said. JoniMitchell fans can dial into Breese's web page at http://www.JoniMitchell.com or join a discussion list at http://www.jmdl.com. Chris Watson is a Sentinel staff writer. She can be reached by e-mail at cwatson@santa-cruz.com. This article has been viewed 2,046 times since being added on November 11, 2005.